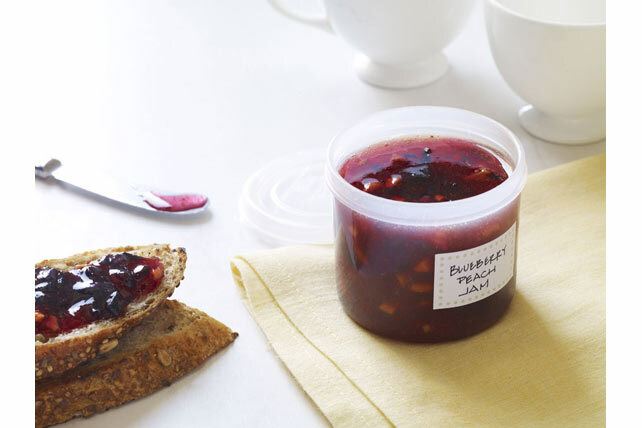 Preserve the fresh fruit flavour of juicy blueberries and summer-fresh peaches with our Blueberry-Peach No-Cook Jam. Rinse 6 clean (1-cup) plastic containers and lids with boiling water. Dry thoroughly. Mix first 3 ingredients in large bowl. Stir in sugar. Let stand 10 min., stirring occasionally. Fill containers immediately to within 1/2 inch of tops. Wipe off top edges of containers; immediately cover with lids. Let stand at room temperature 24 hours. Store in refrigerator up to 3 weeks or in freezer up to 1 year. If frozen, thaw in refrigerator before using. Add whole peaches to pan of boiling water; let stand 30 sec. Remove peaches from water with slotted spoon. Immediately place in bowl of ice water to stop the cooking process. Remove peaches from the water, then peel with a paring knife.